This is the part where I get to show off. I'm not much of an artist when it comes to creating new things...that's where Ian comes in. However, since I think that I have some sort of artistic talent, this will be a forum for my sketches. I don't own pencil crayons, and I can barely use Photoshop as it is, so plain old pencil sketches are whatcha get. I warn you, I have an affinity for cartoon characters and CD covers with really interesting lettering. 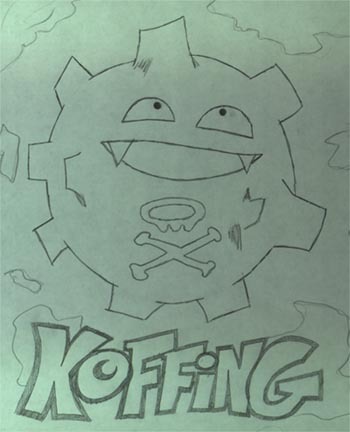 This is my rendition of Koffing. A rather childish first attempt at a Pokemon character, but then again...look at who you're dealing with. 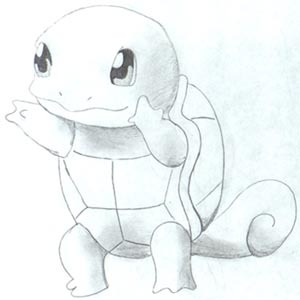 I personally think that this attempt at Squirtle, who just happens to be my favourite Pokemon of all, is MUCH better than Koffing. Maybe it's just the little extra bit of love that I put into it.